The instrument consists of a graduated arc of 90 degrees, and two pivoted arms, one fixed to the arc, the other sliding along it. The arc is engraved with a scale of degrees divided to 10, to 5 and to 1, numbered from 5 to 90 by 5. Close to the fixed arm are two further holes. 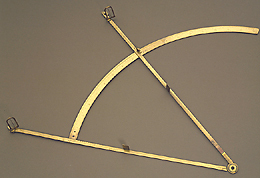 The arm to which the arc is fixed has engraved an unequal scale of degrees, starting from the point where the arc is riveted, divided to 5 and to 1 degrees by alternate shading from 90 to 15, numbered from 90 to 10 by ten. It is inscribed 'The degrees for Azumothes' followed by a scrollwork. The other arm is similarly engraved and has a screw to adjust the arc. On the arm, close to the screw, is also a further hole, and another one, bigger, is on the end of the arm. On both arms are two vertical plates at about the middle of the radius length and two sights at the end of the arms.